The kitchen, bathroom and toilet have been totally refurbished with a microwave oven/grill, dishwasher, fridge, four-plate ceramic halogen hob, slow cooker, kettle, teapot and radio/CD player, all-new tiling and carpets. There is a double bedroom, a room with bunk beds, and a lounge with two large divans that convert into either three single beds or a double and a single. All beds have continental quilts. You can choose between parking under the building for €86 per week or in the open at the foot of the Funival for €68. Our apartment is very quiet, on the ground floor at the rear of the building facing West and South, five minutes walk from the Funival; even less to the chairlift or gondola giving access to the high speed 8-person Tufs chairlift over to Tignes. The ski school meeting place, supermarket, shops, etc are a three minute walk and there is a good choice of local quality bars and restaurants. Linen and Towels: Duvets and pillows are provided, but not bed linen or towels. If you don't want to take your own, we can arrange for them to be left in the flat ready for your arrival and collected after you've gone. Local tourist taxes and a final clean are included in the price. Please contact us for details of our other flats in Tignes. I've been skiing every year since 1973 and absolutely love it. I know the Val d'Isère and Tignes ski area really well and can offer helpful advice to our clients. I bought this property so that I could afford to take my family of six skiing at an affordable price. It was rented out to pay the mortgage and, because we use it a lot ourselves, it is maintained to a high standard. Great Location. Its very quiet, at the rear of the building facing West and South, looking out at the mountains. No roads with noisy late night revellers wandering past in the small hours! Its just 2 minutes to the Telecabine de La Daille and ski school meeting place. The fully tiled bathroom has a large heated towel rail while the bath has a glass shower screen and powerful shower. The toilet is separate. Electric radiators in all rooms, electric towel rail in bathroom. Bed linen at extra cost. Private WiFi router connection available at extra cost. But not required as on ground floor. Two large divans to seat six in comfort. Several saucepans and frying pans (full list on request) plus slow cooker. Many utensils. On the ground floor facing West and south, looking directly onto the mountains. Ten miles away at Tignes Val Claret. Well equipped apartment in a great location. Would definitely stay again. Delighted to hear that Andrea is likely to stay with us again in the future. Every year, one third of our guests have previously stayed with us. Very well equipped, and better than average standard for French ski apartments! Well located just a short walk from La Daille lifts. We are delighted that this family enjoyed their stay. Over a third of our bookings each year are from previous clients and we hope this family will return in the future! Well organised little chalet in an accessible location. Had a great time staying in this chalet with my wife and teenage children. Good value, clean and simple, but with key essentials like WiFi. We are delighted this family enjoyed their stay. Over a third of our bookings each year are from people who have previously stayed and we hope to welcome this family again in the future. Great couple of weeks here enjoying the last of the ski season. Very comfortable apartment and well equipped (including WIFI), and also really clean. Whilst small the apartment makes really good use of storage space with cupboards, hooks and shelves galore. In a quiet spot so great for getting a good night's sleep but only a few minutes easy walk to get up the slopes and even shorter to the bus stop. Free Buses into Val run early to very late so really easy getting about. Loved being able to open the door and stand looking up at the amazing mountains. And with the spring sunshine was great sitting on the little deck chair on the small terrace. Recommend Le Barillon restaurant just across the road and La Rosee Blanche bar above it for a drink. Couple of points - sofa's are a bit tired and could do with updating; and the terraces could do with weeding as the plants in the cracks are causing the tiles to lift. Remember to take a hairdryer - I didn't and had a bad hairdo for 2 weeks. Apartment and support from C+D Ski highly recommended. This is a very fair assessment. There are other excellent restaurants nearby as well as Le Barillon. The point on the sofas is well made - serviceable but beginning to show their age a little. The same is true of the table and chairs although this wasn't mentioned. Both are under review for replacement. The terraced areas outside the lounge door and the kitchen door are being re-laid this summer. Every year about one third of our clients have stayed with us previously, either in this flat or one of the three units listed on HomeAway as Property 1628. We hope Jo will return at some point in the future! Great location for slopes and amenities. Great location for slopes and access to all amenities - ski hire, bus , shops etc. This apartment is well maintained and has everything for a comfortable and enjoyable stay. Chris was very helpful and gave us useful information. Local restaurant Le Samovar highly recommended. Will definitely recommend this apartment to friends! About one third of our clients have stayed with C & D Ski proviously and we hope to welcome Sharon and her friends in the future. We had a wonderful week in Val. 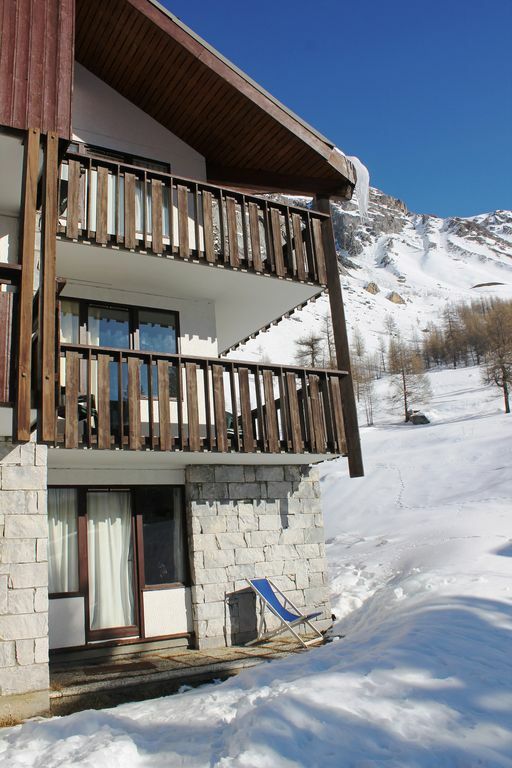 Our flat was ideally situated across from the slopes in La Daille and would suit 2/4 people. Like most French apts it is compact and bijou but perfectly comfortable and clean. Communication with the owners was prompt and we received very good service from Chris. We would return to this apartment and would recommend it to other travellers. I'm delighted to receive a positive review from Janette on the location and comfort, although I think she was a little conservative saying is suits 2-4 people. There are two bedroom, each for two people, before starting to use the three beds in the living room. Val d'Isere with its linked ski area, Tignes, is a global top 5 ski station catering for beginners to experts. Both Val d'Isere and Tignes are well-known for great off-piste ski opportunities, and both now cater extensively for Boarders with half pipes and play areas. Facilities for non-skiers are extensive and there is a very wide range of summer activities also. A final clean and local tourist taxes included in the price Private WiFi including the four UK iPlayers is availabe at extra cost. Duvet cover, sheet, pillow case and towel hire available at extra cost.